While I experienced some anxiety during my pregnancy, my overall experience was very positive. Norway has an excellent health care system, though the fact that I would not be able to choose the doctor or midwife, who would deliver my baby, did cause me some anxiety. 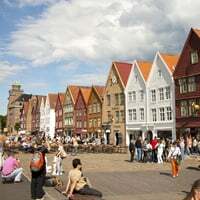 Help others moving to Norway by answering a set of questions about health insurance, public healthcare in Norway, prescription medicine, quality of medical care and emergency services. Read recent baby reports submitted for Stavanger and Oslo.